I first ‘met’ Kentaro Toyama when he was blogging as the ICT4D Jester. 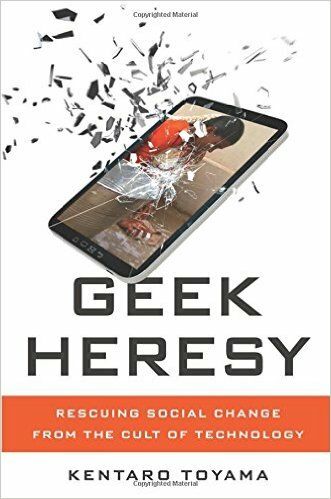 So when he published his book ‘Geek Heresy – Rescuing Social Change from the Cult of Technology’ I was curious to learn more about his personal transition from Microsoft researcher to W.K. Kellogg Associate Professor of Community Information at the University of Michigan School of Information and, more importantly, the context of challenging the tech-centered logic that is driving a lot development initiatives, especially when teaching and learning are involved. To get straight to the point: I believe that Toyama delivered one of the most interesting and intellectually astute contributions to the ICT4D debate in many years in an engaging format that effortlessly combines professional insights, relevant anecdotal evidence from ‘the field’ and a broader theoretical framework that demands serious discussions with the development industry. We filed a patent, convinced Microsoft to release a free software development kit, and imagined that schools around the world would benefit. We declared victory, and temporarily forgot about the lack of toilets, the silent parents, and the absent teachers (p.4). Sure, nowadays some venture capitalist steps in to ‘disrupt’ the sector rather than Microsoft, an accompanying open data platform monitors the performance of teachers and an external research team is involved in a more structured way, but in the last ten years since Toyama first arrived in India technology-driven has been criticized, not least here on the blog. Leaving Microsoft to change the world? There is no background chapter on how the author experienced poverty him-/herself, no single ‘aha’ moment along the line of ‘when I saw this girl carrying a bucket of water in rural (developing country) I knew I had to do something’ and no founder myth on how the author borrowed 10 dollars for gas from his only remaining friend to attend a tech conference. Toyama always personalizes his narrative throughout the book, but he finds the right, humble tone and always seemed to be around empowered and empowering colleagues. In his professional world nobody needs to be ‘rescued’ by ‘us’ and our amazing technology. Digital technologies are just an extreme example of what could be called packaged intervention-any technology, idea, policy, or other easily replicable partial solution meant to address a social problem (p.57). 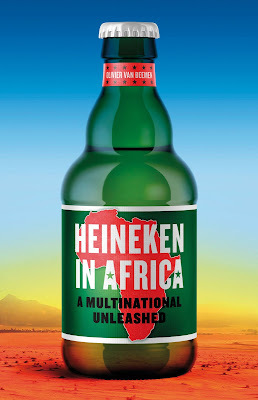 Novel, measurable, large-scale, turbo-charged, value-free, market-oriented packaged interventions for freedom-drunk, goal-driven, meritocratic individualists dominate our notions of social change (p.99). My hope in the rest of the book is to show how heart, mind, and will-not just in individuals, but in societies-are the essence of social change (…). I’ll use the term intrinsic growth to describe progress in intention, discernment, and self-control (p.133). This is a big endeavor and in a very clever way Toyama resists the temptation to come up with his own ‘manifesto’ or a similar approach to ‘fix’ development or IT/ICT4D. we should focus on those goals for which technology and technocracy are ill suited: serving poor communities, educating the less educated, reforming dysfunctional institutions, organizing marginalized groups, preparing for long-term crises, encouraging self-transcendence, and eliciting responsiveness from those with power (p.210). Then again, technology does play a role in many of the areas he outlines, but I guess that overcoming the disconnect between ‘drones can save lives’ or similar ideas (or maybe even ideologies) and truly, humanistic social change will be one of the big issues for 21st century ‘development’ debates. How radically can we (and want to) rethink ‘development’ in the 21st century? Toyama is not a development expert in the more traditional meaning of the term and I wonder how other debates need to be tied into the amplification discussion: How have the ‘results agenda’, focus on ‘impact’ or the application of RCTs and natural scientific methodologies shaped our understanding of ICT4D? And what can we do about it? Additional intrinsic growth would mean less material consumption and more involvement with self-transcendent ends. Other countries would likely follow. 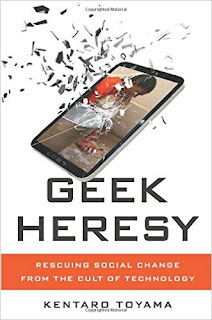 Toyama, Kentaro: Geek Heresy: Rescuing Social Change from the Cult of Technology. ISBN 978-1-61039-529-8, 352 pages, USD 19.40, PublicAffairs, New York, NY, 2015.